Artificial Intelligence being a hot topic these days gives us a lot of opportunities and thrills our imagination. Sensing the inevitability of its rise, we got so fascinated, that it brought us to the open event at SharpMinds on February 6th . 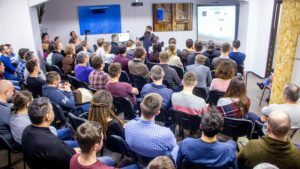 We were happy to host over 100 guests from the local IT community, as well as an amazing speaker, Oleksandr Maksymets, who kept everyone involved for about three hours. The presentation of Chernivtsi Artificial Intelligence Club was given by Petro Ivaniuk, our Python developer. Brilliant questions and agitated discussions have kindled an interest in the subsequent AI meetups, which we hope to host in our office in March.